Available in three sizes, both beds in the Bedford Falls Bunk Bed feature slatted bed ends and stylized bun feet. The combination of a distressed finish and deep Molasses color creates a rich, distinguished look. Whether you choose Twin-over-Twin, Full-over-Full, or Twin-over-Full, any duo can be separated into two stand-alone beds. Any size Bunk Bed will also accommodate either of the Bedford Falls under-bed units and will come with a matching curved, grooved ladder and a removable shelf for top bunk bedside storage. 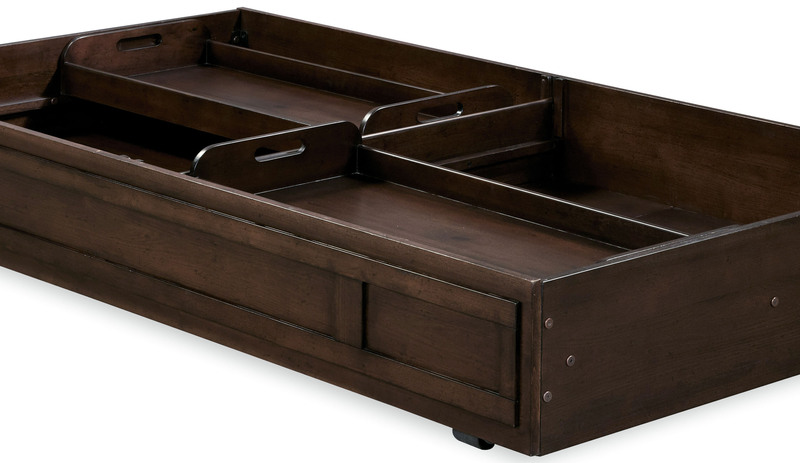 Use with optional underbed Storage/Trundle Unit (Holds a twin Size mattress x 7" Deep) or Giant Underbed storage bed with side cubbies. When using Optional underbed unit, rail sets high for mattress only. Upper Bed accomodates regular thickness mattress (up to 10"), which is available in different qualities. Our Mattresses have kid-friendly features like Anti-Microbial, Anti-Bacterial & Hypo-Allergenic. Mattress will be delivered at the same time as the bed at no additional delivery charge. 6 years old is the recommended minimum age for this or any brand top bunk as per the U.S. Gov't Consumer Products Safety Commission. We offer only white glove delivery, complete set up and removal of all packing materials. We will not be undersold by any store or website. If you see this item for a lower price, please tell us and we will match it.